This is my post about which gym equipment and features you need for the ideal home gym. If you can’t see the video click here. 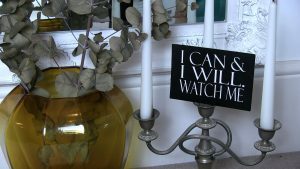 I thought I’d do this post towards the end of January as that is when most New Year’s resolutions have been broken. I’ll be honest, my one of taking a daily teaspoon of cumin (don’t ask) lasted about a week! Of course the most popular January commitment tends to be going to the gym. How many of you joined in the first week? How many of you are still going? A fitness environment is perfect for some, but if it’s not working for you, stop wasting your money as I have another solution. Creating a home gym may be easier than you think – even with limited space. Do you have a box room, that’s become a dumping ground? Checking out your thunder thighs in the mirror is the perfect catalyst to finally clearing it out and making it your exercise space. In fact tidying can be a workout in itself. Trust me I did it recently! Maybe you have a guest room. How often to you have guests to stay as would it not have more use if its primary purpose was to fight the flab?! Now I understand not everyone has that space kicking around – particularly as homes are getting smaller. Just dedicating a corner of a room to sculpting your six pack could be all you need. The important thing is that it’s somewhere you can leave gym equipment out. If you have to set everything up each day, you invite procrastination into your fitness routine. Here are my simple, but vital criteria for the ideal home gym. Having a workout mat is key. The thickness will depend on how hard your floor is. Bear in mind if you’re uncomfortable when exercising it gives you an excuse to stop. If the mat is too soft though it could create an unstable surface causing balance issues. Colour is worth thinking about. I have a red mat for my more energetic workouts and a cream one when I need calm, like when doing yoga. Think about what mood you need to be in when exercising. Even if you don’t feel you need a mat it could have the psychological benefit of saying “I’m working out”, rather than “lolling around on the carpet!”. Research has shown that exercising in green spaces lifts your mood and can even help with depression. After all, happy exerciser is a regular exerciser. Unfortunately the time taken to get to green spaces for many is too precious. Even if you live next to a park, the weather isn’t always on your side. I still think you should get outside as much as possible, but for those days when you only have limited time or the rain is against you, you could still benefit from greenery. Making sure there are plants in your home gym or space has a couple of benefits. The aforementioned psychological points, but also the air purifying bonus. Don’t forget plants take in carbon monoxide (which we breathe out) and emit oxygen. The more oxygen available to us the better we exercise. Bingo! (oh and decreasing bingo wings!). Spider plants and Dracaenas are great air purifiers. That said, the upkeep of covering a room with plants can be time expensive. Time when you could be crunching those abs! How about supplementing a couple of real ones with faux plants that give you the mood lift without the maintenance. Gym equipment is obviously your friend, but only if it has your full attention. Did you know that if you focus on the muscle you’re exercising, it’s actually a more efficient workout? For this reason it’s better if you don’t have the distraction of a TV. 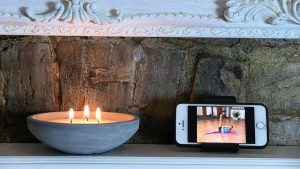 If you like to watch workout DVDs needs must, or you may just require a well positioned shelf for your phone or tablet. I’ll admit I have one in my gym because I like my daughter to watch me exercise so she grows to love it like me. Sometimes it takes putting on Disney films like Moana to get her to stay in the room. Although after a matter of minutes she’s providing extra resistance by jumping on me! If you do have a rug rat in your gym, obviously be careful about which gym equipment is left out. Sorry. You didn’t need me to say that did you?! Not that any of us revel in seeing ourselves in lycra but watching yourself doing certain exercises helps you to get them right. This makes them more effective and prevents injury. For this reason having a mirror in your gym, and a large one if you have the space, should be considered just as important a piece of gym equipment. Once you’re over seeing the lumps and bumps, at least you can watch your body taking shape over the weeks. Well that’s the idea anyway! Remember to celebrate even the smallest of changes – even if it’s just that you’re liking the look of your elbows. “Ooh check out the elbows on her”!!! If you do have a little one, or one on the way, it’s worth thinking about where your home gym or exercise space is going to be. Naps, early mornings and evenings will probably be the only times you can fit in a workout. If, like me, playing loud music is what really gets you going, you don’t want to be limited to wearing head phones. This obviously applies if anyone in the house works different hours from you. Also if you are placing a treadmill on upper floors you will need reinforcement, and it’s best to place it in the corner of the room where there’s more support. It’s not always possible to have the sun gushing in. The day I’m writing this it’s hard to imagine there is a sun. 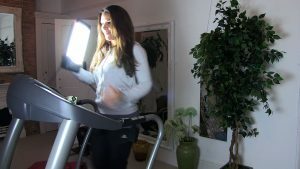 Having as much natural light as possible though can really help the effectiveness of your workout and your mood. If the only place you can exercise is in a windowless box room a SAD light can do wonders. 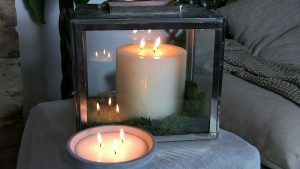 For more relaxed workouts like yoga or meditation, fitting a dimmer light could be worthwhile, but I personally think that you can’t do better than candles. I do love to have my motivational cards on display when I’m exercising though. Yes I laugh at them, but they do help me go the extra mile! 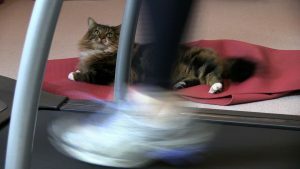 Of course, a furry cheerleader is an unnecessary but desirable addition to any home gym! Do you know the irony of this post is it’s really made me want chocolate! Maybe if it’s accompanied with that teaspoon of cumin I could get away with it! If you’re needing some extra motivation, make sure you’re setting SMART goals – here’s some help. For daily posts and live demos come and follow and chat with me on The Home Genie TV Facebook page.